Perhaps whether we like it or not and whether we know it or not, ideas and beliefs are arranged in an order of dependence so that certain beliefs form the conceptual basis from which and upon which all of our other beliefs depend. Understanding and decisions on more fundamental or major questions affect positions on subsequent major and minor issues. In other words, for each one of us there are certain values, beliefs, or decisions that take priority over all others and by which all others are subsequently determined. These more "fundamental" or "foundational" beliefs that, in turn, dictate or influence the rest of an individual's worldview are often referred to as "pre-suppositions." When individuals engage in discussions about worldviews, often the debate is spent focussing on "later" concepts without ever addressing or identifying the underlying pre-suppositions that are determining each individual's position on the topic at hand. This can happen both when two Christians discuss doctrine or when a Christian and non-Christian discuss their differing worldviews. And simply having a pre-supposition isn't bad on its own. Its whether or not a person understands their own pre-suppositions, builds them logically one from the next, and identifies them in their discussions with others, that determines how skilled they are as a rational thinker and even how valid their beliefs are. Persons whose beliefs are arbitrarily constructed, without their own understanding of where they came from or why they hold those views cannot be deemed "wise" concerning such matters, no matter what their worldview, Christian or not. When the most fundamental disagreement is not identified and only "later" or "secondary" questions remain the focus, then conversations cannot be productive, no matter how much evidence is presented and no matter how persuasive the arguments are. When each side's view is ultimately governed by an earlier pre-supposition that is never itself discussed, neither party will ever be discussing their real source of disagreement - their differing pre-suppositions. And since their real disagreement is not being analyzed and no evidence or argument is being brought to bear on it, there can be no hope of bridging the gap and arriving at rational persuasion, and ultimately, agreement. Conceptually, this approach is like trying to cure disease, without ever identifying the root cause, but instead only looking at the symptoms. Doctors can treat symptoms all day, but unless they are able to identify and treat the underlying cause, problems will simply remain unabated. This chart as well as the "Taxonomy of Systematic Theology Chart" are designed to show the relative heirarchy and flow between individual concepts within theological thought and history. 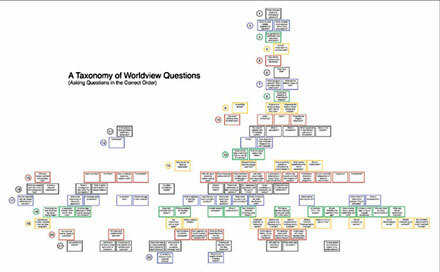 In the chart below, questions are arranged on 22 levels, with the more fundamental questions depicted at the top with the lowest numbers. 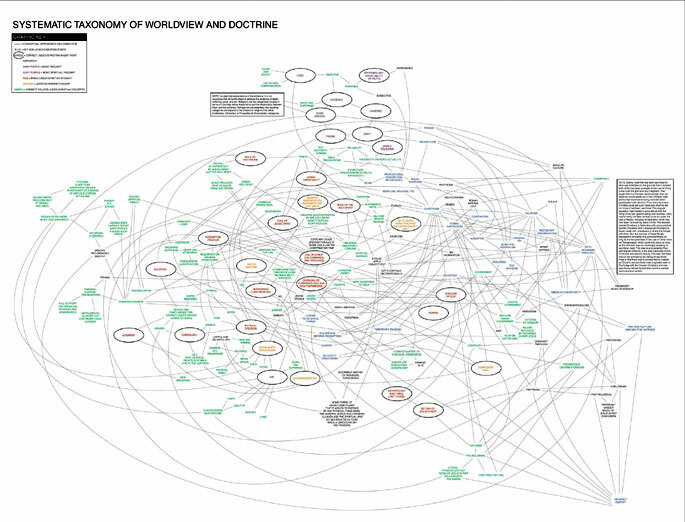 The goal of the chart is to facilitate making discussions about worldviews and Christian doctrine more productive by enabling parties engaged in a discussion, to actually identify and start with their most foundational disagreement - to build agreement from where the real source of disagreement lies.